Sussex Under-17 Girls celebrate their achievement of reaching the national One Day Cup final. Sussex’s Under-17 Girls and Boys both took part in national finals this week. The boys shared the Specsavers ECB County Championship after drawing their final with Northamptonshire. Meanwhile, the girls finished runners-up in the Royal London One Day Cup after beating Staffordshire in the semi-final and then narrowly losing to Yorkshire in the final. After rain made play impossible at Bishop’s Stortford on Wednesday, the girls’ matches were both played on Thursday and reduced to 25-over affairs. Staffordshire were defeated by five wickets, with spinners Charlotte Hepburn and Polly McCarthy taking three wickets each and opening-batman Ella McCaughan top-scoring with 35 during the run-chase. After winning the toss and batting first in the final, Yorkshire posted 106, with seamer Cassidy McCarthy taking 3-16. Despite a good start, Sussex lost quick wickets in the middle overs and ultimately fell 36 runs short. Reflecting on the team’s successful season, Sussex Under-17 Girls Head Coach, Alexia Walker said: “It all started well in the winter where the girls put in the hard yards and developed at the Sir Rod Aldridge Cricket Centre. “I could not have asked for a harder working, determined and dedicated bunch of players. They have been a great team to work with, they have wanted to improve as players throughout the year and it has shown in the matches they have played. Wicket-keeper and opening-batsman, Joe Bilings top-scored with 134. There were half-centuries for Nick Smith, Tom Gordon and Will Sheffield, the latter hitting 76 from just 71 balls. Henry Crocombe was Sussex’s wicket taker. Abdullah Nazir bowled an extremely economical spell, his six overs going for just six runs. Speaking after the match, Sussex Academy Director, Carl Hopkinson said: “I’m extremely proud of the boys. Their dedication and hard-work has paid dividends and they fully deserve the title of County Champions. 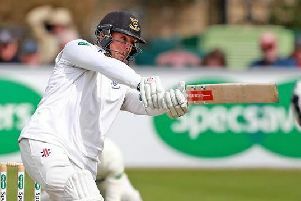 “It’s frustrating that the weather prevented an outright winner being decided, particularly after we had posted such a good total in our first innings. “Nonetheless, the squad should be very proud of their achievement. It’s especially satisfying given how many of the boys have come up through the Sussex age groups.